Assange Contractor Arjen Kamphuis’ Belongings Found at Sea - Deep State? There's breaking news coming out of Norway surrounding Arjen Kamphuis, a personal friend of Julian Assange and a close associate of Wikileaks, who themselves have numerous unanswered questions since their founder went dark. 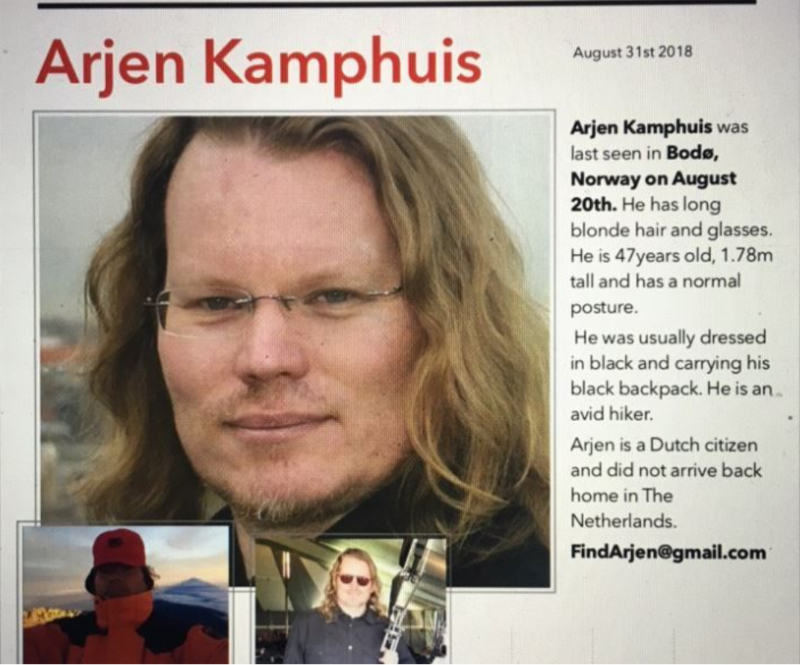 Arjen Kamphuis went missing from Norway on August 20th and the Netherlands-born and self-described “free software advocate" and "IT security adviser” hasn't been seen or heard from since. First, the local community of Bodø, Norway, followed quickly by the homeland family of Kamphuis, began a search effort. They feared the worst, but it turned up nothing. Wikileaks even used their Twitter to inform followers about the search on September 2nd. <blockquote>Arjen Kamphuis ble sist sett i Bodø, Norge den 20. August. Han har langt blondt hår og briller. Han er 47 år gammel og er 1,78m lang. Han er vanligvis kledd i svart og har store med seg sin svarte ryggsekk. Arjen er nederlandske turgåere på ferie i Norge. Skeptical of such behavior, or perhaps with some other incentive for doing so, Wikileaks would tweet on September 6th that Kamphuis was missing. That phone linked to Kamphuis was switched on near Stavanger, a city just 990 miles (1600km) from Bodoe. To make matters more interesting, a <i>German</i> sim card was inserted into the phone at the time. Oddly enough, today, Wikileaks tweeted a message, prior to the announcement of finding the belongings of Kamphuis, that the UK had said, “perhaps we shouldn't send people to the US to be executed,” just two hours prior to the announcement. Now we know with certainty that Kamphuis' belongings were found, as reported by<a href="https://news.sky.com/story/missing-wikileaks-associate-arjen-kamphuis-belongings-found-in-sea-off-norway-11495850"> Sky News</a>. "Kamphuis has still not been found and the case is open for different outcomes, but we still haven't found anything that indicates a crime has been committed," Norwegian authorities stated. The world is watching now, as Julian Assange has been cut off from the internet for several months, and we simply are unsure as to who holds the keys to Wikileaks, or whether Assange and Kamphuis are even alive. The Ecuadorian Embassy in London states that Assange is safe, although that hasn't stopped the endless theories about Wikileaks being compromised. If you have any information about this case, you're urged to contact Norwegian authorities immediately. PRAYING TO GOD HE IS SAFE AND SECURE. HOPING HIS STUFF WAS DUMPED TO CREATE A SCENERIO. GOD BLESS HIM AND HIS FAMILY AND JA.